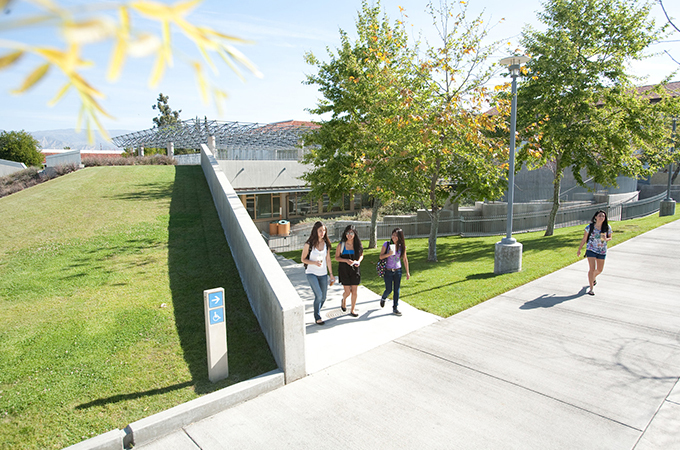 Students gather outside of Lewis Hall, a LEEDS certified one-story, earth-sheltered building that features recycled carpeting, a courtyard with native plants, and a green roof. Professor of Environmental Studies Monty Hempel, who chairs the U of R Sustainability Council, chatted with Mika Elizabeth Ono and Katie Olson of U of R’s Bulldog Blog about the council, environmental education, and what a sustainable community means for the U of R.
Bulldog Blog: How long has the U of R Sustainability Council existed? Monty Hempel: The Sustainability Council is only about three and half years old. In the past, temporary groups of faculty and students have done some outreach and held student forums, but establishing the council in 2014 brought continuity. Even though the council is only a few years old, the motivation for prioritizing sustainability has been building for about 15 years. In 1999, we began infusing several of our courses with themes of sustainability and a course focusing entirely on sustainability was implemented in 2010. We have faculty members who are very interested in teaching those kinds of courses. BB: What’s the council’s mission? MH: We think of ourselves as a kind of sounding board. We’re always looking for ways to make the campus more sustainable and eventually want it to be a place where people can easily funnel their suggestions to the president and provost. There are 12 members, including three students, who meet about once a month. We have a broad group of representatives, including members from Facilities Management, Outdoor Programs, CAS and School of Business faculty, and the Development Office. BB: Do the students volunteer to be on the council or are they selected? MH: The student representatives come from ASUR [Associated Students of the University of Redlands] and clubs on campus. Usually, the president of the Students for Environmental Action is a member and acts as a sustainability leader for students. Students who are interested in sustainability and who want to represent their organization are always welcome. We like to have at least two students on the council so we can keep a dialogue open with the student body. BB: Can anyone come to the council’s meetings? MH: We’re in the early stages of establishing processes for the meetings, but people are welcome to come and contribute their ideas. The more interesting thing might be the upcoming sustainability forum, hosted by the Students for Environmental Action [Wednesday, March 21, 7 p.m., in University Hall]. But the council would be happy to have visitors. BB: What have been the council’s biggest successes? MH: Getting our website established was a large step forward. We recently compiled our first comprehensive report on campus sustainability, identifying a lot of progress in the past, as well as steps we’d like to take in the future. We are also developing measures of sustainability performance as part of the Association for the Advancement of Sustainability in Higher Education (AASHE) Sustainability Tracking, Assessment and Rating System (STARS) along with a number of other colleges and universities across the country; the system allows universities to volunteer to do a case study of their campus to track campus-wide progress of sustainability measures—from the food served in the cafeteria to total water use on campus. Also, having a president formalize what the council is working towards is a major step forward. BB: What are your hopes for the future, both near and longer-term? MH: We have different projects currently underway. For example, we would like every first-year student to receive a guide on campus sustainability, explaining sustainable programs, facilities, behaviors, and lifestyles on campus, so that students can get a sense of how they can do their part—whether that be taking shorter showers or trying to conserve energy. In the council, we also ask questions such as “What can we provide for the rest of the campus that might be important for sustainability and lifelong learning?” There is an educational component to a lot of what we do, as we know this will impact our students as they go into the 21st century, as well as future generations. In addition to courses and workshops, the buildings themselves have the potential to teach students. I like to call Lewis Hall, which is LEED-certified, an adjunct faculty member because it’s designed so that students can learn from interacting with and studying the building. At some point, we also hope to develop a Green Revolving Fund that would finance sustainability projects on campus. Eventually, we would like to have students propose plans and then finance the projects with money from the fund. Then, the money that the campus saves from these sustainability initiatives would be put back into the fund to support additional projects. I think that would be a nice dimension for bringing incentives to this campus in the future. I would also love to see a full-time sustainability coordinator for this campus eventually. BB: What are the major constraints in developing a sustainable campus? MH: Money … and culture is also important. How do you make people aware and encourage them to participate in efforts to make the campus more sustainable? Sustainability can be seen as an abstract concept; it’s about becoming green, prosperous, fair, and inspirational. Sustainability is not only for the Environmental Studies Department. Everyone has something to gain from a more sustainable campus. I personally like the idea of combining the word “sustainability” with “community” as a real calling for the campus. Sustainability is, I think, a new organizing principle for universities. If you wanted to find a unifying philosophy for the delivery of higher education, I can't think of a better one than sustainable communities.